Ian Russell, WSAA, receives the Whitby Gazette Rose Bowl Trophy from Arthur Robinson. Photograph by Bernard Vasey. Arthur Robinson presenting The Whitby Gazette Trophy 1924 to Ian Russell, 8th January 1995. Sponsored by The Black Swan. 84 anglers entered and 26 weighed in. Ian also won the Heaviest Bag, 21 lb 06 oz. Ian Russell, WSAA, 12 lb 03 oz. 8th January 1995. Photograph by Bernard Vasey. 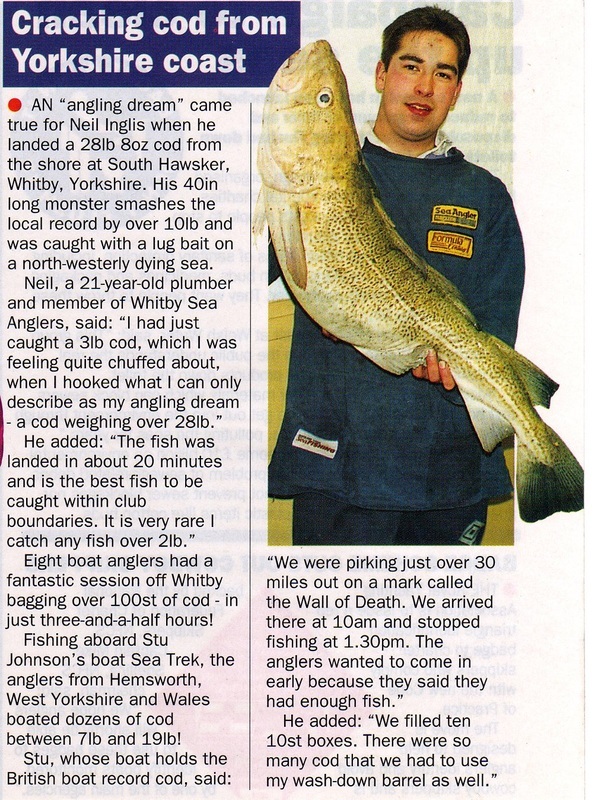 Neil Inglis, WSAA, 28 lb 08 oz, 26th February 1995. Photograph by Bernard Vasey . Neil Inglis, WSAA, 28 lb 08 oz. 26th February 1995. Photograph taken just after fish landed by Bernard Vasey. Neil Inglis, WSAA, 28 lb 08 oz. 26th February 1995. Photograph by Bernard Vasey. 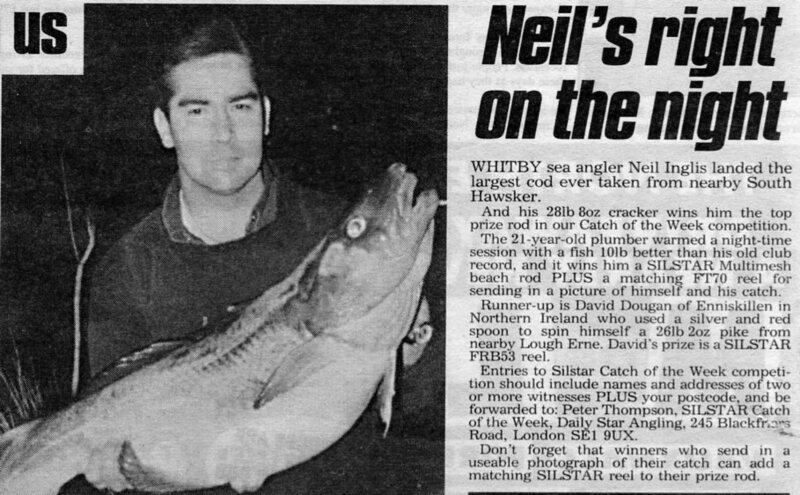 As reported in the Angling Times, from Neil's press clippings. As reported in Daily Star, from Neil's press clippings. 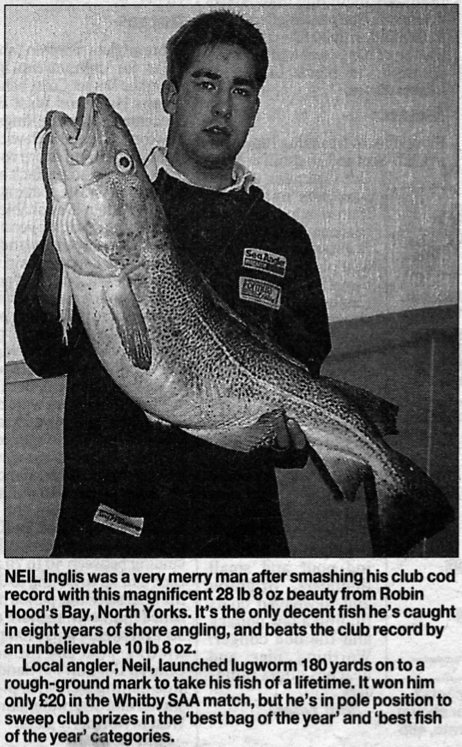 As reported in Sea Angler, from Neil's press clippings. 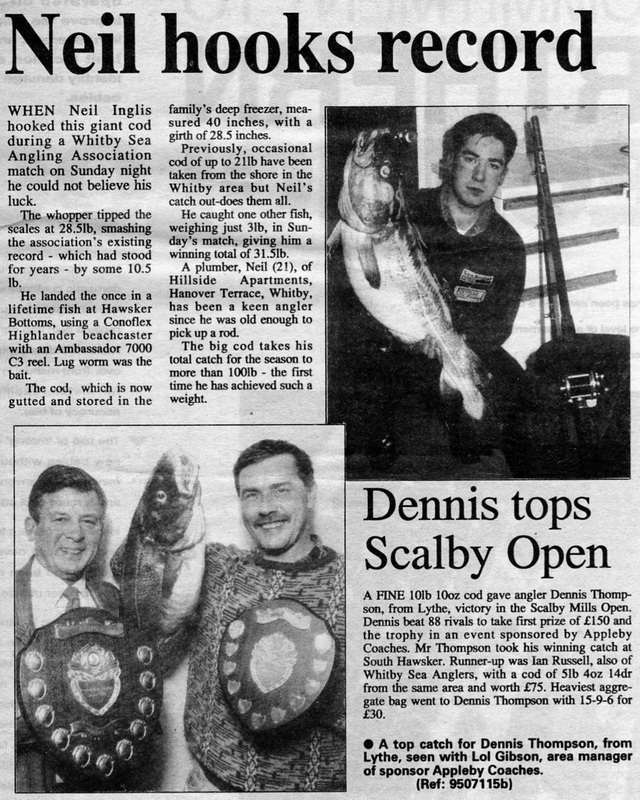 As reported in Whitby Gazette, from Neil's press cuttings.